Shasta Taiko will present a mini formal performance at POPS Performing Arts & Cultural Center, 5819 Sacramento Avenue in Dunsmuir, Saturday, July 28 at 7 pm. Featured will be guest artists Masato Baba, son of Shasta Taiko leaders Russel Baba and Jeanne Mercer, and his wife Courtney Deguchi. Masato and Courtney will also perform with Shasta Taiko and join Tadaima’s set with Russel on winds and Jeanne playing taiko. With the intimate atmosphere at POPS, Shasta Taiko will perform compositions that focuses on refinement and subtlety. Fun and exciting festival style taiko soloing will also be featured. Tadaima is a creative music ensemble that performs original compositions influenced by jazz, world, classical, and new music. Masato Baba has evolved into one of taiko’s leading artists. He is the Artistic Director of award winning Los Angeles based TaikoProject and a member of cutting edge On Ensemble. Shasta Taiko has presented both groups several times to the Mount Shasta community. Courtney Deguchi is a performing member of TaikoProject and leads community taiko classes for children and adults in LA. She is an emerging taiko artist and singer, and with Masato, is spreading taiko’s sound around the world. A charge of $10 is being asked at the door. Young people 16 years and under are Free. “Our goal has always been to expose taiko to the community and the world.” says Russel. 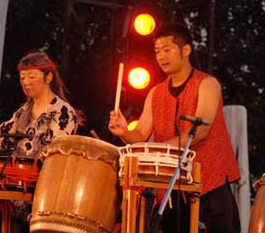 Shasta Taiko is a non-profit arts organization 501 (c) (3).